The finest technique exhibited during the practice period, no matter how refined, polished, and brilliant the hymn playing, improvisation, or performance of repertoire may be, will fail in public performance in the presence of a haphazard or inappropriate registration. The tonal characteristics of organ stops and their artistic combination is an essential and separate branch of study in organ playing, so much so that many books have been written on the subject. It's something that must be studied away from the instrument and verified with on-going experiments at the keys, as each instrument is different in its tonal make-up from every other. The subject, in fact, is so broad that isn't possible to even begin to scratch the surface of it in one blog posting, but there are some general do's and don'ts that can be listed here, to give an idea of what this is all about. One of the things that makes organ playing so fascinating is that the sound can be changed; just like the conductor of a grand symphony orchestra, the organist isn't limited to one type of sound but has literally an astronomical number of combinations of timbres and pitches at his disposal, even in a modest instrument, blending one into another like the tints of a kaleidoscope, which he then uses to apply muscle, artery, and sinew to the skeleton of the score left to him by the composer [See blog, Calculating Stop Combinations, Parts I-III]; all that remains then is for the organist, as conductor, to breathe life into it by means of skillful interpretation. The first thing to do when we're presented with a new instrument is to listen carefully to every stop all by itself in its various octaves and to get familiar with its characteristics; tremendous beauty and utility is available to artist organists to do their tone painting simply by using the stops singly in their various registers. If the tone quality of an 8-foot stop isn't quite right for the solo needing to be played, then a 4-foot stop can be tried and played and octave lower; a 16-foot manual stop might also be tried and played and octave higher; these colors and tone qualities are also present in the instrument but often overlooked because of where the solo line is written on the page, which implies an 8-foot stop for its execution. Everyone who expects success in their endeavors adapts their way of working to fit the situation at hand; those who settle first on some particular way of working and then try to cherry pick situations that fit the way they want to work have things exactly in reverse; this isn't what being a musician is all about and is deadly for an organist. Organists, of necessity, need to be constantly on guard to adapt their manner of playing to the resources of the instrument at hand and how it comes across in its own acoustical environment; this adapting would certainly include transposing a solo passage up or down an octave on the keys if it meant securing the best timbres the instrument had to offer. Some experimentation should be done, paying particular heed to the manual flutes and reeds at octave (4-foot) and suboctave (16-foot) pitch. If the Great is supplied with a 4-foot Rohr Flute, for example, and its tone is quite strong -- let's say it's a big, burbley flute -- then it could make a good solo voice when played an octave lower; in the same way, if the unimitative Oboe in the Swell isn't of the precise tone quality we're looking for, maybe it's too dull, then the Swell 16-foot Bassoon or Fagott played an octave higher may have just the right color and fit the need perfectly. Flute tone speaks quickly and is generally best in its normal orchestral range, i.e. above middle C4; below that the tone gets more indeterminate in color as the range descends. By the same token, unimitative string tone can sound thin and pinched up high but is generally rich and has good definition in the tenor range. 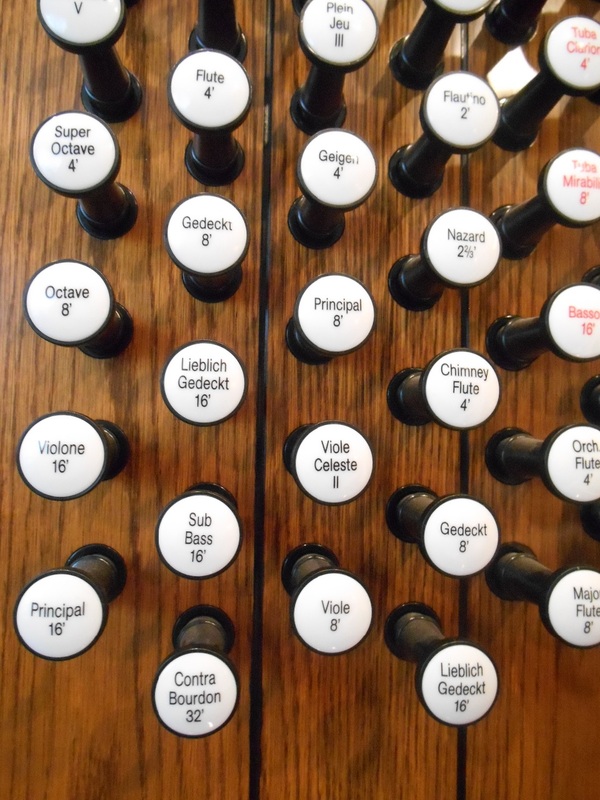 In pipe organs, undulating stops such as the Unda Maris (mistuned flat), Flute Celeste (mistuned sharp), and Voix Celeste (String Celeste mistuned sharp) are never combined with the full organ [See blog, Tuning By Division]. Mutation stops having fractional numbers represent overtones in the harmonic series and thus are never used by themselves; they're always combined with at least one other stop at fundamental pitch, and in the manuals these stops are generally best above middle C4 where they do not draw attention to their own melodic line or tend to disturb the unison pitch of the division. A so-called "gap" registration is one in which the stops drawn sound pitches more than an octave apart, e.g., 8-foot paired with 2-foot ... or 16-foot paired with 4-foot ... or 8-foot, 4-foot, 1-foot; gap registrations may also include mutation stops such as 8-foot paired with 2-2/3 foot ... or maybe 8-foot, 4-foot, 1-1/3 foot. Gap registrations are not limited to stops of a certain family of tone; stops of different timbres might also be combined in these gap registrations, such as by coloring an 8-foot Gamba with a 2-2/3 foot Nazard (pronounced "Nuh-zard'); if the Gamba is really edgy in tone the Nazard will reinforce it without being heard separately itself; coloring a 16-foot Bassoon with a 2-foot Flute will create some very interesting effects; we can also substitute a mixture stop, if not unduly assertive, in place of a mutation stop in these gap registrations, e.g., a soft mixture stop paired with a hollow sounding, covered 8-foot Flute produces a different, sparkling, and striking color. When the organ is small, lacks an 8-foot color reed for solos, and the music calls for such a stop, a "synthetic Clarinet" can be contrived by drawing the 2-2/3 foot Nazard and 1-3/5 foot Tierce with an 8-foot Flute. The addition of a soft 8-foot Flute or French Cor De Nuit stop to an 8-foot color reed like the Orchestral Oboe of Cor Anglais gives it additional body and roundness; to color a solo reed we typically add a soft 4-foot Flute, but it also could be colored with the addition of the Nazard or maybe a 1-1/3 foot Larigot (pronounced "Lare'-ih-go"). The French Cornet (pronounced "core'-nay") stop, not to be confused with the German "Cornett" which is an open solo Pedal reed, is the name applied to a solo mixture stop, generally flute toned but rarely made of soft Dulciana (pronounced "Dul-chee-ah'-nah) or string ranks, or to a combination formed by drawing flute toned pipes at 8-foot, 4-foot, 2-2/3 foot, 2-foot, and 1-3/5 foot pitch; these 5 ranks when present as individual stops represent in fact a decomposed French Cornet where the 3rd sounding rank (Tierce) is essential. Each note of this French Cornet stop usually incorporates these same 5 flute toned pitches but in some situations the 4-foot or 2-foot rank has been omitted; as a mixture designed for solo use, the stop contains no breaks and works best above middle C4. Where the music is long enough that a solo reed stop might become tiresome, the French Cornet seems best suited to an ornamented chorale melody, but it's important to remember that unprotected Tierce stops or the French Cornet should never be used in a minor key as violent false relations (tonal clashes of major/minor) would result. Accompanying a reed solo with a stringy 8-foot Gamba should be avoided because the Gamba more or less absorbs the tone of the reed, and if the box is closed it's no longer heard at all. There's only one rank of pipes in the organ whose characteristic voice depends upon the effect of the tremolo, and that's the Vox Humana; this reed stop is invariably one of the 6 basic tonalities of unified pipe ranks which form the core of all theatre pipe organs which were built in America c. 1915-1935 (the other 5 ranks were Tibia Clausa, Diaphone, Viole d'Orchestre, Tuba Horn, and a color reed such as a Clarinet or Oboe Horn) where the Vox typically appears as a manual stop only, at 16-foot, 8-foot, and 4-foot pitches. NOTE: the smallest theatre pipe organs built in America generally always had these same 6 fundamental ranks of tone color as a minimum; all the rest of a theatre organ, no matter how large or elaborate its scheme may be, is built upon these same 6 ranks of pipes; the smallest cinema pipe organs built in the UK generally were schemed around a minimum of 6 fundamental ranks as well, but with slight differences (these ranks were Diapason, Violin, Tibia Clausa, Concert Flute, Vox Humana, and a Wurlitzer Style D Trumpet or equivalent). As an 8-foot reed stop in a concert or church organ the Vox Humana is a valuable voice and should invariably appear in an expressive division of the organ; when the organ has a really fine example, it should be treasured; so many annoying, disturbing, we might even say "vile," examples of this stop exist in different organs, partly because its tremolo isn't regulated properly and it flutters entirely too fast to blend with any other other classic voiced stops. This stop should also be paired with a soft helper stop to give body to its thin, nasal voice; this helper could be a soft flute stop in the same division or maybe a not too assertive stop of unimitative string tone in another division to which the Vox could be coupled, thus providing compound flexibility and expression; some wonderful, kaleidoscopic tints of color and some very beautiful effects can be obtained this way when the tremmed Vox in the organ is coupled to a Viole, Gamba, or undulating Voix Celeste stop in a different expressive division and made to speak through the same manual. Generally speaking, with the exception of certain early French organ music (and, of course, in theatre organ playing), tremolo is never prescribed for full combinations; generally it's never used with mistuned ranks, either; the beauty of an undulating stop like the Voix Celeste or Unda Maris is mostly if not totally negated when it's tremmed. When playing on an 8-foot ensemble of foundation stops the strong flutes should not be drawn as they would only cloud the harmony. Except in the Pedal, reeds are generally avoided in polyphonic music; manual reeds, if they're tame and not too blaring, might be used at times in the manual plenum where they can lend a certain luster without dominating; in this type of music (such as a Bach fugue) a mild 16-foot reed (Fagotto, Bassoon, or Posaune) in the Pedal paired with an 8-foot Principal or Gedeckt works well; this helps the ear to keep the bass and tenor lines separate in a work where the entire effect of the piece depends upon the clarity of the moving lines. In performing early (pre-1800) organ repertoire such as a Bach fugue, stops and couplers may be added along the way, 2 or 3 at a time, as the emotional intensity of the music rises; terraced dynamics with subtle layering of sounds is what's needed in Bach playing, not the instantaneous addition of stops and couplers in large clumps as is possible with the modern organ supplied with pistons and an electrified combination action. It's also necessary to keep in mind the type of instrument for which the composer wrote; in the case of Bach, for example, in his day 4-foot manual reeds were rare in the organs of central Germany and are best left out of the full organ when performing his organ music today; further, each manual had a basic pitch of its own (typically 8-foot for the main manual, 4-foot and 2-foot for the secondary manuals) where the coupling of manuals to the main manual meant the combining of different principal choruses or ensembles of varied pitch and color. In many of Bach's free organ works chords are written in close harmony for the main manual plenum (principal chorus through mixture) fairly low in the tenor octave; if suboctave manual stops at 16-foot pitch are drawn for these passages they should in every case not be unduly assertive and have relatively high harmonic content (Quintaton, Violone, Bassoon. etc. ); all dull, thick sounding, assertive 16-foot Gedeckts and Principals should be avoided in these types of passages. Bach was familiar with the Unda Maris stop which was being inserted in certain German organs by the mid-18th century, but stops of more modern development such as the Flute Celeste, Erzahler, Erzahler Celeste, Voix Celeste, highly charged color stops such as the Harmonic Flute, Viole d'Orchestre, Orchestral Oboe, French Horn, or Clarinet, and any big reeds or other stops with an extremely edgy tone, all of which were unknown to Bach, must be used with extreme care, if at all, in performing his organ music. In the buildup to full organ, stops should be drawn economically with the fewest number of stops employed to meet the desired effect; this author prefers a lean sounding full organ built upon bright sounding principal choruses, unimitative strings, chorus reeds, and mixtures in which all thick, muddy, tubby sounding, wide scale flutes and diapasons, exceptionally big reeds, and screaming mixtures are left out. In this buildup, when the suboctave stops (16-foot in the manuals and 32-foot in the Pedal) first come on, balance should be kept in mind; some of the upperwork (4-foot stops and higher) kept in reserve for this moment should be drawn at the same time; this same upperwork should be retired at the same time if and when the suboctave stops are retired; such changes, when made, should never be jarring. When the first reed chorus enters, the mixtures of the same division are usually, but not always, drawn with them along with certain other upperwork, depending upon the organ. Typically the French 32-foot Contra Bombarde stop speaks with a glorious voice; some of the finest examples, such as the incredible one in the Pedal division of the Cavaille-Coll instrument at Saint-Ouen in Rouen (very probably the finest stop of its kind in the world), not only have clobbering power sufficient to crack a diamond but are a real thrill to hear (this entire instrument remains to this day in fact as one of France's national treasures). If the instrument at hand happens to be supplied with this commanding voice and we're playing French music that calls for it, its tone is typically powerful enough but not always quite as brilliant as that found in French organs; by drawing or coupling a not too assertive Mixture with this big reed we add harmonics and may succeed in approaching something closer to the same tone as found in the French stop. It also goes without saying that this voice and other big reeds like it are best kept in reserve for the final section or climax in the music; for best results these types of stops have to be gradually worked up to, following a progressive buildup to full organ [See menu bar, Videos, Toccata Festiva, for an illustration of this]. Just because a certain stop, by name, is present in the tonal scheme does not automatically mean that we can or should use it in the full organ [See blog, Set Limits]; we may have to leave out some of the big reeds, 2-foot stops and mixtures, and thick sounding flutes if their inclusion in the full organ muddies the sound or cloys upon the ear, especially if it's an electronic instrument employing older technology; as always, the ear has to be listening to everything and is the final judge when it comes to our choice of stops. The sound of the full organ may also dictate that 2 manuals rather than a single manual be used for climactic passages; for example, in an older electronic instrument with all manuals coupled and both hands are playing spread chords on the Great, if our ear tells us that the highest notes on the Great are too blaring and shrill it may be necessary to keep the left hand on the Great and move the right hand down to the Choir; this can be facilitated if the instrument has a separate volume control for the Great which can be turned down just a bit so the rest of the full organ coupled to the Choir is almost just as strong without the Great added. While these kinds of adaptations typically aren't necessary when playing a pipe organ, the idea is to communicate a language of warmth and meaning to our listeners regardless of the instrument with which we're expected to work, and our ear is the key to getting us there.